It's the two wheels in the air that unnerve. That, and the neat, handbrake-triggered arc around the tight left-hander that we’re eyeing. 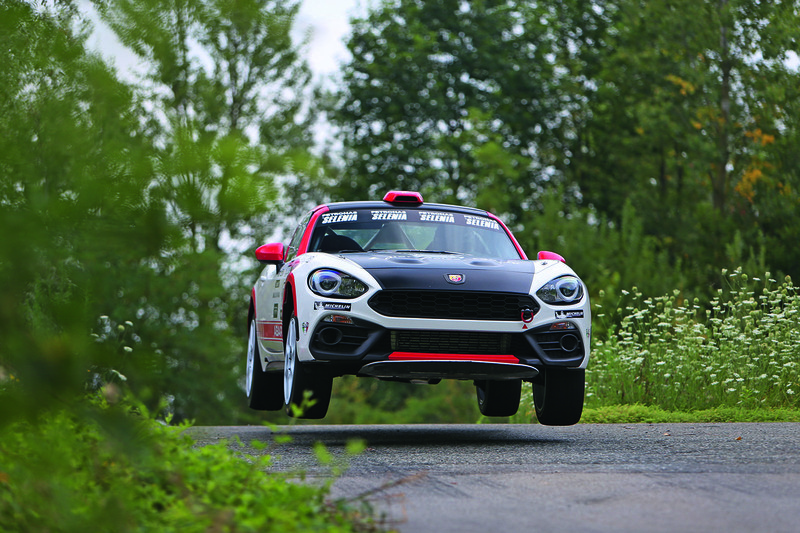 We’re watching an Abarth 124 Rally squirting around a custom special stage within Fiat’s Balocco test complex and the man getting air, frequently, is test driver and former World Rally Championship (WRC) competitor Alex Fiorio. The reason that this exciting sight is slightly unnerving is that your reporter will shortly be the first outsider to drive this car around Balocco’s special stage, which aims to emulate a seriously twisty and poorly maintained Tarmac rally section. I’m wondering if getting two wheels airborne is wise when there’s plenty of steering and braking to do once they reconnect with Earth. And this isn’t any Fiat 124 Rally, either, but the first prototype. “We love it,” says technical development chief Maurizio Consalvo. “It’s our first baby.” Oh. Good. to produce an ideal 50/50 weight distribution that’s all the more vital in a rally car that spends most of its time urgently changing direction. via a pair of generously scaled carbonfibre paddle shifters; there is a clutch pedal, but for starting off only. The steering wheel carries most of the 124 Rally's key controls, from indicators to headlight flashers, horn, wipers, washers, starter and launch control; all of these buttons are tiny but no more than a thumb span away. The most intriguing occupants of the wheel's boss are two small rotary knobs labelled ALB and TC. The former controls the sensitivity of the throttle over five positions, delivering a gently measured response at one end to suit gravel, snow and other low-friction surfaces, with the other extreme triggering instant reactions appropriate for hot sticky tyres on hot sticky tarmac. Traction control (TC) provides just that, its effectiveness heightened by a mechanical limited-slip differential. There are five settings here, too, each allowing the 124 Rally to drift further out of shape, the final click providing no interventions at all. “It’s not very different from a road car in terms of the parameters it measures,” says Consalvo, “but it needs to be quick, aggressive and work in the hands of a driver with considerable experience.” It also allows the rear end to slide more in the lower gears. If that’s not enough for a graceful slide around a hairpin, there’s always the huge vertical rod between the seats: the fly-off handbrake. Before the drive comes the ride, allowing some chance to memorise a stage notable for a surprising number of very similar tight 180deg turns, some long sweepers, a yump and the bit where Fiorio lofts the car's passenger side skywards. He demonstrates the effects of those rotary knobs, deftly deploys the handbrake and shows breathtakingly little respect for the road’s edge and the Abarth’s flanks, assaulting undergrowth and cutting over deep gullies that have you wincing for the impact. Strangely, we feel barely more than a tremor. The same can’t be said of my heart rate as I’m strapped into the deep-walled Sabelt race seat and waved off. The engine sounds promisingly rorty (once I’ve restarted it after a beginner’s stall), gathering revs at a rate that soon has the limiter hit, despite the lines of fast-illuminating LEDs and the mildest throttle map. Whines, road noise and rort provide exciting distraction, as does the disorienting sameyness of the stage. But learning car and circuit are fast-tracked by the Abarth’s forgiving demeanour, its modest size and the ease of seeing through a windscreen that’s more vertical than is common these days. You sitting relatively low not only improves the car's centre of gravity but also puts you in closer touch with what’s happening beneath – highly desirable when travelling flat out on shifting surfaces. its ride, which absorbs big bumps without turmoil. Firmly progressive brakes, the big paddle shifts, the powertrain’s zest and the Abarth’s sheer wieldiness make for stellar entertainment while you work to get the best from it. This 124 Rally is doubtless a lot easier to drive than many rally cars, but it’s not so easy that it doesn’t require addictive practice to get it dancing effectively. Configured to compete in the FIA R-GT class, it’s also intended to “ignite the passion of a new generation as well as old-fashioned rally lovers,” says Consalvo. The two-seat, two-wheel-drive R-GT class was introduced in 2011 but the limited-to-non-existent take-up was boosted by the FIA R-GT Cup in 2015, won by François Delacour in a Porsche 997 GT3. 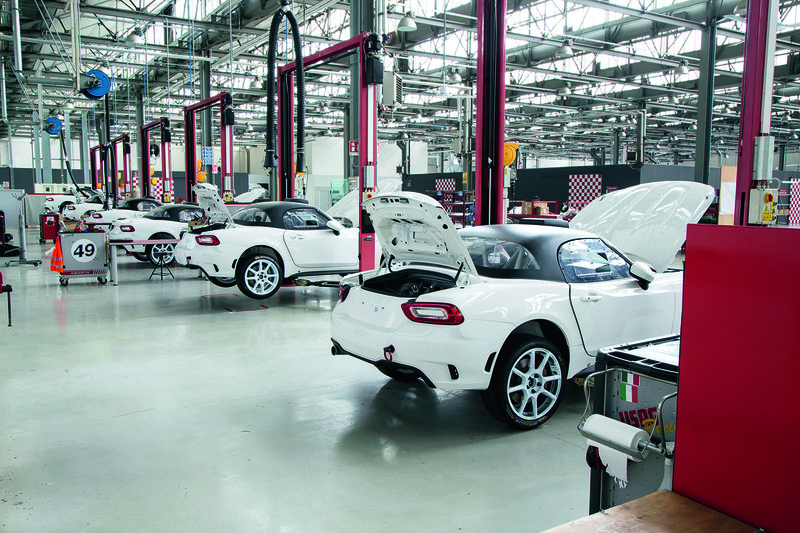 The class was dormant for 2016, but Abarth revived it for 2017. 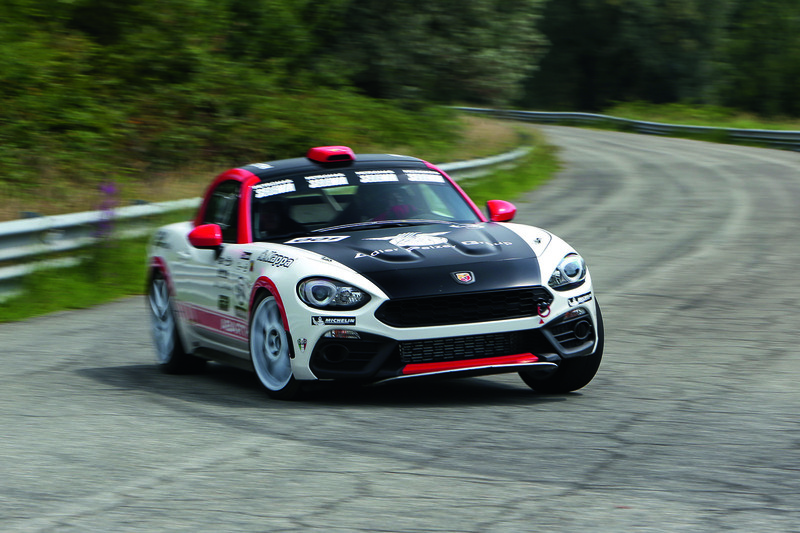 There have been only four teams contesting the R-GT class this year, all in Abarth 124 Rallys, which may seem a poor endorsement. 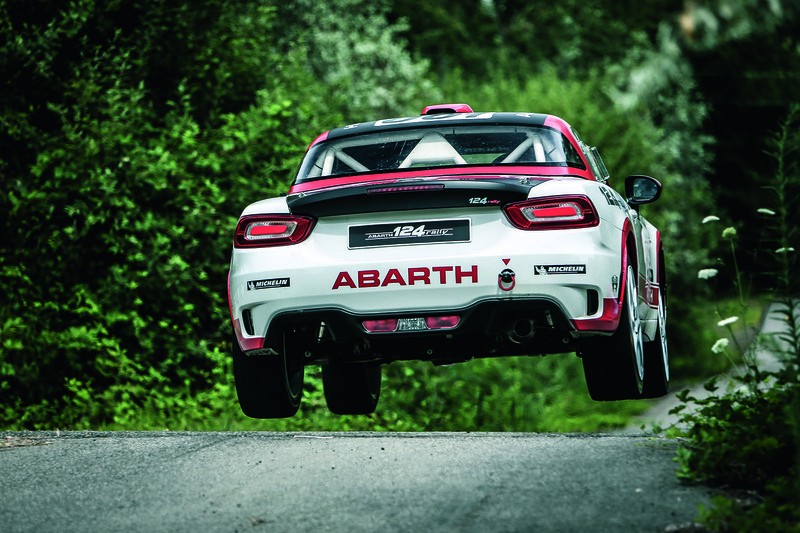 But this is a much lower-budget venture, both for Abarth and any rally driver keen to experience a well-developed and hugely entertaining car for a fraction of the stratospheric price of a WRC machine and attendant team. The fact that we saw a line of around eight 124 Rallys under preparation for next season suggests a series that’s shortly to liven up. Consalvo hopes for competition from rivals, too. lack of air conditioning and rudimentary trim. Abarth has no plans for road-going versions of this car and Consalvo won’t say what elements of this mechanical package might be offered separately, but he does point out that the rally car uses standard suspension pick-up points. Given Abarth’s fine tradition of offering serious tuning parts in Scorpion-branded wooden crates, the prospects are rather mouthwatering. It's the first time I ear speek about traction control in a rally car. I thought it was forbidden.